Finding healthy food while traveling can be a bit of a challenge, especially if you want to avoid processed and non-organic food. In many areas of the country it’s not easy to find healthy local food easily as a visitor, thus it takes some pre-planning on your part. Taking the time to plan ahead will not only save you money on restaurant costs, you’ll also have more energy and you’ll be less likely to come down sick while traveling. Mr Chiots and I have taken a lot of road trips and have come up with a few techniques to eat healthfully while on the road. 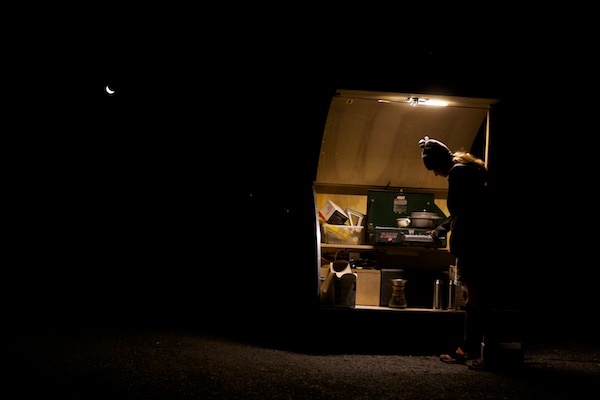 Here are some things we do to ensure we’re eating healthy nourishing food on the road. PLAN AHEAD: figure out the route you’ll be taking and use LocalHarvest.org, RealMilk.org, EatWild.com or Google to find small farms, farm stands, local food restaurants and farmer’s markets along your route. Make sure you note days/hours of operation as sometimes smaller local shops can have strange hours. 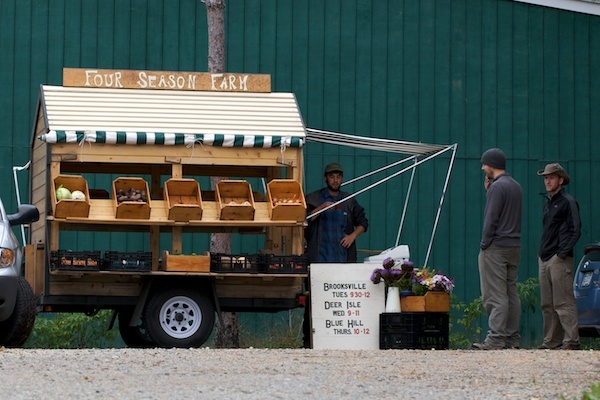 When you are at a farmer’s market or local shop ask a few folks for recommendations. 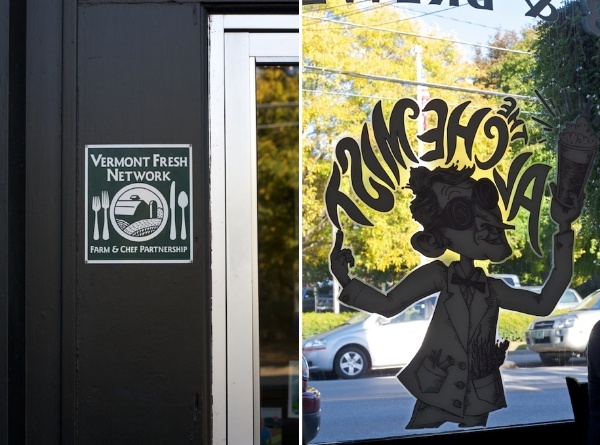 Some of our best sources for local food have come from recommendations from the locals. It has been our experience that large cities are often the easiest places to find markets with local, healthy food alternatives. I have a google map that called “places I want to go” and whenever I hear of a garden, interesting museum, small farm, local restaurant or other interesting thing I add it to this map. Since I’ve been adding to it for a few years I now have a great resource for our travels, generally there are a few great places to visit and get healthy food no matter which direction we head out in. ENJOY THE LOCAL FLAVORS: A little time of research before you set off will let you know if the area you’re visiting has any specialties. 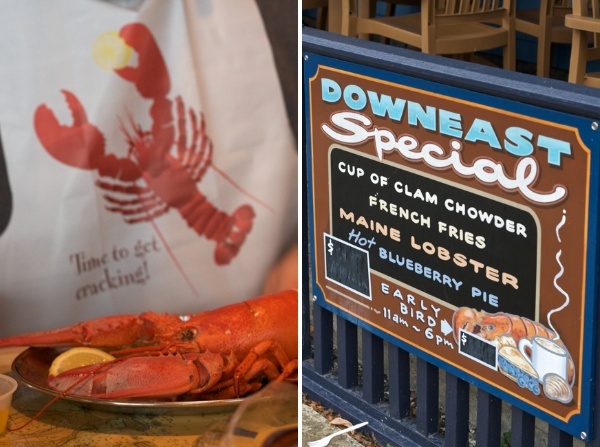 If you’re headed to Main, dine on lobster and blueberry pie; in Gloucester, fried clams from Essex Sea Food is a great option. It’s not always about eating healthy but about enjoying what each specific region, city, area has to offer. It may not be organic or healthy but at least it’s fresh and local. DON’T LET YOURSELF GET TOO HUNGRY: Nothing will ruin your healthy eating intentions while traveling faster than letting yourself get too hungry. This can be a challenge if you’re trying to plan your meals around specific locations. Keep the car stocked with protein rich snacks that will help keep you from needing to stop somewhere to grab a quick bite. STOCK THE CAR WITH HEALTHY SNACKS: If you’re famished you’ll be more likely to make bad choices or have to settle for less than ideal food. Keeping the car stocked with healthy will keep you from getting too hungry. Choose snacks that like, there’s no reason to stock up on snacks you don’t like, then you’ll simply end up wasting snacks if they go bad and still eat drive-thru food. Some of our favorites are: cheese, jerky, bacon, olives, sourdough bread, salad, crispy soaked nuts, hard boiled eggs, a cooler with milk, yogurt, salad & greens, tuna salad, baked custard cups and other things. You’d be amazed how simply drinking a glass of milk or eating a cup of yogurt can help curb hunger and keep you healthy when you’re on the road. Local milk is also fairly easy to find in most areas. BE UNUSAL: Don’t fell like you need to stick to the common idea of what a meal is or what time is the right time to eat. When you’re on the road a meals of cheese, olives, jerky, vegetables and fruit is perfectly healthy. Sometimes you may need to adjust your eating times if you end up reaching a destination early or late. Sometimes that means eating one big meal mid-afternoon rather than lunch and dinner if the local restaurant happens to fall at a certain place. THINK OUTSIDE THE DRIVE-THRU: Consider purchasing a small backpacking stove so you can cook your own meals. We often stop at rest areas and warm up soup or cook scrambled eggs. Sometimes a hot meal is what you need and having a few tools to prepare simple one pot meals can make all the difference. Come up with some quick one pot or one skillet meals that you can prepare in a snap. One our favorites is fried potatoes, onions, mushrooms, green peppers with eggs poached on top. Even just scrambled eggs will be a quick healthy meal while you’re on the road – and eggs are pretty easy to find along the way. 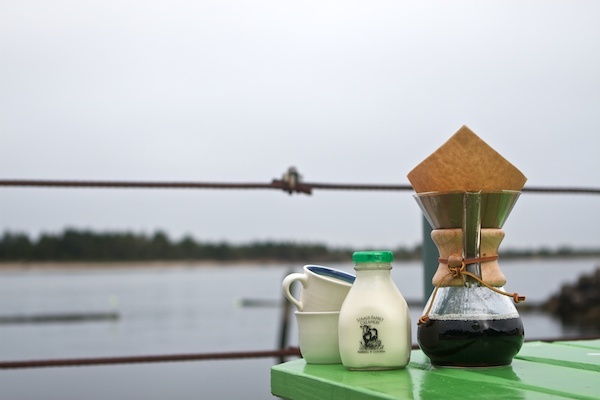 INVEST IN A FEW ITEMS LIKE WATER BOTTLES AND INSULATED MUGS: If you’re a coffee drinker, buying a Chemex or other simple coffee make can save you big $$$ on the road and it can save you the letdown of all those bad cups of coffee. Investing in a few nice stainless steel water bottles (we have 8 Klean Kanteen bottles in various sizes) and insulated mugs will repay themselves many times over (we love these Klean Kanteen Insulated Mugs because they keep hot beverages hot for hours). Refill the water bottles at rest stops or from your own filter that you take with you. Make your own coffee in the morning and fill your mugs so you don’t have to stop (unless you can find a fantastic small local coffee shop that is). WHEN YOU FIND SOMETHING GOOD, STOCK UP: When you do come across a great market, restaurant or farm stand, stock up on food for the next couple days. If you find a great restaurant, consider getting a meal or two to-go so you can eat it the next day. If you find a great farm stand, refill your cooler and snack box with fruit, vegetables and other healthy snacks. GIVE YOURSELF SOME LAST MINUTE OPTIONS: There are a few national chains that offer healthy food. If you haven’t come across a farmer’s market or a farms stand, stop at the local grocery store and get some food. If you’re hungry and don’t feel like eating anything you have in the car, stop at Chipotle or a similar restaurant that offers fairly healthy local options. This is where planning ahead comes in handy. If you spend an hour or so before your trip programming local/healthy food options into your GPS or noting them on your map, you’ll have a great reference and can avoid unplanned stops. LIGHTEN UP A BIT: You’re on vacation, so cut yourself a little slack in the food department. Savor those fried clams and french fries without guilt. While we never “swing through the fast food drive-thru” while traveling, we will stop at a local shop and enjoy french fries and burgers at times. Most of the time you should be able to find local healthy stops, but when you can’t – enjoy it! 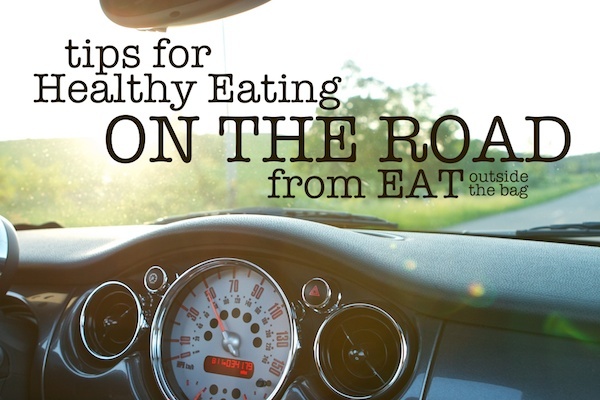 What tips do you have for healthy eating while on the road? Any great small local places in your area you’d recommend to people traveling through? 6 Responses to Q & A: What do you eat while traveling? If anyone is passing through Columbus, OH, I would highly recommend a stop at the North Market (in the Short North district). http://www.northmarket.com – plenty of fresh foods, coffee, ice cream, etc. I second the yogurt if you’re in the car and can have a cooler. If you add flavorings like pureed fruit that make it more liquid, it can be drunk right out of the jar or a cup. Good for kids, too. Oustanding ideas! 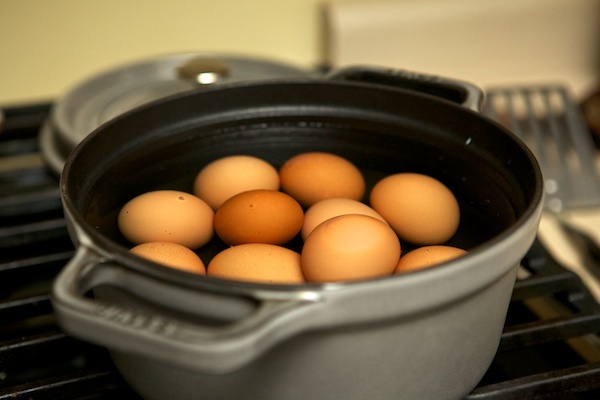 I am so thrilled you took so much time to share thoughts on this topic!Boiled eggs are perfect, and I can not believe I never thought of them…Thank you! We are really looking forward to our trip and now I have lots of ideas for eating well while we travel. What a great post! You’ve just given me the most brilliant idea! Thanks, Susy! Am I ever glad I found you again as our computer died and I lost all my links. What a great post as we are always looking for ways to eat healthy on the road especially with 3 teenage boys. Recently I’ve taking to making my own fruit “roll-ups” in lieu of candy for both lunches and road trips.